Medical bills which run into six-figure territory are "not uncommon" for British holidaymakers who end up needing emergency medical treatment abroad, travel insurers say. Typically, nearly 3,000 travellers who require treatment in another country are helped by insurers every week, according to the Association of British Insurers (ABI). Around £200 million is paid out each year to help people who fall seriously ill overseas. The ABI said a claim for treating a stroke in the United States cost £768,000 - a figure that would take someone more than a quarter of a century to earn on an average UK salary. The bill included £60,000 for an air ambulance back to the UK. The US, which attracts 3.8 million UK visitors a year, has some of the highest medical costs, the ABI said. In another case, £252,000 was spent treating a brain haemorrhage and broken shoulder suffered by a traveller when he fell off a bicycle. The alarming figures only serve to highlight the importance of having medical travel insurance in place before leaving the country. The ABI said: "Six-figure medical bills are now not uncommon." It says the cost of the average medical claim, at £1,300, increased by 40% between 2011 and 2016. The ABI has launched a new guide to travel insurance at www.abi.org.uk to help travellers ensure they have the right insurance to cover any "sky high" overseas medical bills and emergency repatriation to return home. When travelling in Europe, the free European Health Insurance Card (EHIC) gives holidaymakers access to state-provided healthcare available to a resident. But it is not a substitute for having travel insurance because it will not cover all medical costs, or the cost of emergency repatriation back to the UK. For example, from Spain, an air ambulance can cost £25,000, the ABI said. 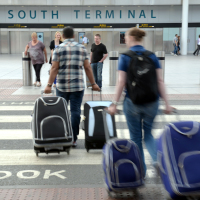 Mark Shepherd, assistant director, head of property, commercial and specialist lines at the ABI, said: "Incredibly an estimated one in four travellers still travel without insurance, despite the fact that the average cost of a single trip policy can be less than what a family spends on snacks at the airport. "With a wide range of competitively priced policies available, shop around, don't forget to disclose any pre-existing medical conditions, and remember that the cheapest policy may not be best for your needs."